I attended a presentation for the Hydrographic Academy with HE STEM today. 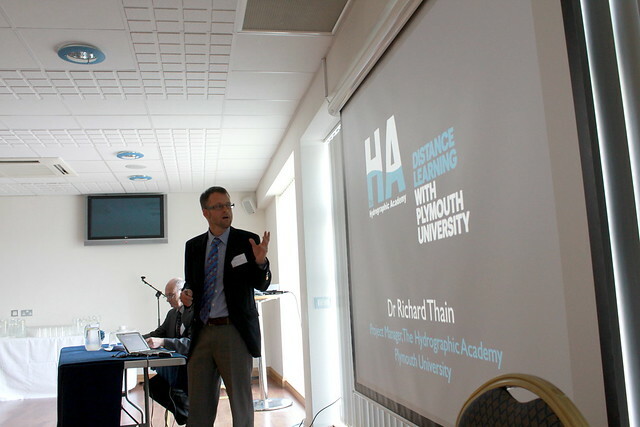 It was chaired by Prof Jim Griffiths (Head of the School of Geography, Earth & Environmental Sciences, University of Plymouth) and presented by Dr Richard Thain (soon to be Director, The Hydrographic Academy) His slides are available from the HE STEM site in PowerPoint format. The rest of the team 'in attendance' were placed on a panel at the front for 20mins to an audience of some 80 persons to help answer any burning questions. It included: Tony Jenks, Luke Denner, Jon Scott and myself. We had a range of questions from student tutoring, support and choice of interface. I think we all did a very good job at answering everything successfully, after all, we know it inside out. We were warmly welcomed by Ruth Waring (HE STEM) thank you Ruth, and delighted at all the positive feedback from others. The Hydrographic Academy has indeed been a lot of hard work from a great team of people and it shows! 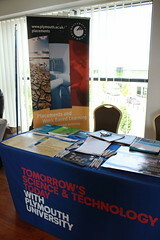 Alison Austin (Placements Officer) and Carolyn Deeming (Schools Liaison Officer) set up the Plymouth University stand with all the Faculty of Science and Technology information and kindly looked after the Hydrographic Academy banner, thank you to them! They chose not to be in the picture... I did try! A big thank to all the other presenters and everyone involved in making this a very enjoyable event. I think this was a superb and fitting finally to our work with HE STEM (South West) region and we were all very pleased to share our knowledge and experiences. P.S....not quite finished with HE STEM...the Academy will also be presenting in the final HE STEM conference in Birmingham later this year.